#1. Cloud & Mobile Technology – GenieBelt wrote that cloud technology is a “must-have” if you want to remain competitive in the construction industry. Utilizing mobile devices to leverage cloud-based technology allows you and other parties on a construction project to communicate from anywhere, at any time. #2. Real-Time Communication – Piggybacking off of #1, utilizing cloud and mobile technology in the field means you can update project status, timelines, budgets, and more in real-time – an important emerging trend according to Construction Executive. Instead of waiting to make project updates by phone or email, completing status updates instantly increases productivity in the field. #3. Automation Acceptance – Instead of fearing automation and the possibility of it taking away human jobs in construction, Construction Dive suggests embracing automation that removes redundant and repetitive tasks. Companies are turning to automation to improve efficiency and accuracy on projects by reducing human error, missing fewer deadlines, and collecting data. #4. Better Construction Software – The Balance Small Business noted that construction software is steadily improving. From bidding to estimating, scheduling, and administrative duties, large and small companies are more able to find affordable software solutions that save time, reduce costs, and improve results in the field. #5. More Efficient Projects – Although the construction industry is struggling with a labor shortage, Construction Executive states that, along with technology, companies are better equipped to respond to the increasing demand to complete projects faster, cheaper, and all-around more efficiently. For the companies not embracing tech, shifting mindsets is key in remaining competitive. With tech as the leader of the construction revolution, the industry will look much different in years to come. 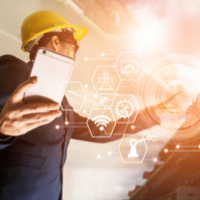 As the industry shifts toward mobile tech, real-time communication, automation, construction software, and efficiency on construction projects, digitalization in construction is bound to become a cornerstone of the industry. DrawAlert was conceived with the notion that the construction industry is ready for change when it comes to technology in the field. To save time, reduce costs, and improve results in the field, contact us for a demo today.